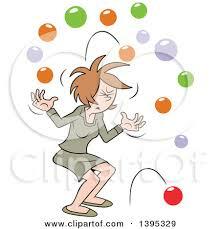 I always know when I’ve dropped one of the gajillion juggling balls that is my teaching job. It’s when my students’ faces have the kind of look a puppy has when it’s being blamed for something it didn’t do. They look at me all wide-eyed and wondering what just happened as they listen to me express frustration. This frustration always happens when I temporarily forget what I know about what my students need. One time, at a moment when I was exhausted and distressed, I forgot that lecturing after 1:00pm is an utter waste of time, completely out of sync with students’ circadian rhythms. They reminded me that I was expecting them to focus on listening at a time when they’d normally be napping. I had forgotten that the schedule for that day had been moved forward an hour and that on any other day, they’d be on their yoga mats, listening to a recording of the sound of rain, while focusing on their breathing. Splotched on the tapestry that is my relationship with my students, are apologies of all kinds. Regrets for lapses in judgement, feelings of remorse for slips of anger, anguish over my inability to keep all those gajillion balls floating in sequence throughout my teaching day. I wish I didn’t have those splotches. I wish I could always be mindful of what I say and do in my classroom. I wish I could always be attuned to my students’ energy. But I know that would take superhuman effort of which I’m incapable. What I am capable of is being aware of when I mess up, and then gathering the courage to clean up. I clean up by apologizing, of course, and then by taking inventory of what I did and didn’t do leading up to the point when the balls were dropped. Usually there’s a missed yoga class, a missed meditation session, many missed walks, and a long list of things to do on my desk. As a teacher, I know that I’m never going to get to zero on my to-do list but I can certainly move up from zero on my well-being list. We teachers have always known this but it’s nice to have the powers-that-be elevate its importance to being a core competency in the new curriculum. I just wish the Ministry would realize that expecting teachers to be effective models for personal and social competency while we are experiencing stress due to the effects of 15 years of deep cuts to education funding, and while we are reeling from the turmoil of a massive system change, is asking for too much. You would think the Ministry would know that, given the fact that personal and social competency is just another way of talking about relationships, it would be motivated to change its relationship with teachers. I bet there’d be barely any dropped balls in my classroom if I had the kind of support and respect that teachers in Finland and other countries have. This is not to say that I don’t accept the responsibility to take care of myself so that I am prepared to take care of my students. It’s just that the BC Liberals certainly don’t make that task any easier. Now, if you’ll excuse me, I’m about to ignore that pile of marking on my desk while I take myself for a well-being walk on this beautiful Sunday. Celebrate the Elimination of Provincial Exams? If I wasn’t so familiar with the Ministry of Education’s Jekyll-and-Hyde character, I’d be thrilled with the new Graduation Program. After decades of frustration about the limits to student learning experiences that provincial exams set, I’d love to pop a champagne cork now that I am free of the fetters they placed on my lessons. The announcement of the changes has revived old arguments about what exams are for. I must say that I disagree with the learned professor who believes that the removal of exams will lead to the dumbing down of learning. I happen to agree with my students that they don’t need to know the details of the Halibut Treaty in order to fulfill their responsibilities as citizens in a democracy. Many of the arguments that Dr. Livingstone makes have been made throughout the history of education whenever changes have arisen. Plato himself lamented the rise of writing in place of dialogue. That was over 2000 years ago. After decades of feeling like a quisling every time I told my students how “important” studying for provincial exams was, I’ll happily let them know that they no longer will have to spend months memorizing the gajillion facts that they can instantaneously access on their personal devices. But my joyful relating of this good news will be dampened by the knowledge that there is no funding to make possible the full implementation of the new curriculum. It’s as though my students have been given the keys to a car without any money for insurance or gas or maintenance or even driving lessons. The new curriculum requires more student-led activities but when schools are at or above 200% capacity where will teachers find the space for breakout rooms so that small groups of students can work together on projects? Personalized learning is one of the core ideas in the new curriculum but with no Education Assistant support for students with special needs, how can one teacher provide personalized learning for all students in a class of 30? 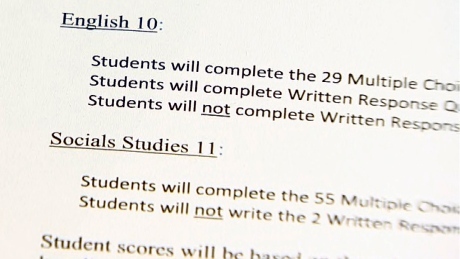 Given the pattern of cuts that the Ministry has imposed on school district budgets, I suspect the elimination of some provincial exams is more of a political rather than a pedagogical decision. If it were purely pedagogical, the FSAs would be eliminated as well. Contrary to what the Minister says about them being “valuable” FSAs only serve to highlight the socio-economic differences between schools. Unless and until the Minister is going to do something to alleviate those differences, they only serve to support the arguments of those promoting the growth of private schools. After 15 years experiencing the BC Liberals’ brand of public education, I have a lot of difficulty believing that the Ministry makes any pedagogically-based decisions. Take a look at the mandate letter that Mike Bernier received from Christy Clark upon his appointment as Minister. His top task is to balance the ministerial budget. His final task (on a list of 13 items) is to ensure that “taxpayer resources” are used “efficiently. Nowhere in his mandate letter is there any acknowledgement of barriers to learning such as a 20% childhood poverty rate in this province. The provincial exams were indeed a barrier to my students’ pursuit of learning and I am pleased to see them gone. Each year my students take on the role of adult citizens when our classroom becomes a country. Through the process of electing a government and participating in an economy, they become curious about many things that will never be on the Socials 11 provincial exam: mercantilism, Machiavelli, Kant’s Categorical Imperative, egalitarianism, ethics. In the past I’ve only had enough time to guide them through brief glimpses of these and many other concepts so they have often been frustrated when discussions had to be stopped because we had to study the Statute of Westminster instead. I am relieved that I will now be able to assess and evaluate my students in ways that fit their learning experiences. Perhaps that’s enough of a reason to celebrate the new Graduation Program. Perhaps. Author Lizanne FosterPosted on May 29, 2016 May 30, 2016 Categories Education for the 21st centuryTags BC Ministry of Education, new curriculum, public education, underfundingLeave a comment on Celebrate the Elimination of Provincial Exams? I wish I could get excited about the new curriculum from the BC Ministry of Education, I really do. I wish I could believe all the hoopla about how the new curriculum is going to prepare our students for their lives as adults in the 21st century. I really want to believe that this time the Ministry really does have our students’ future in mind. But my mind is filled with too many images that keep popping up like gatecrashers at the new curriculum party. Here’s one: a student with severe autism who used to have an education assistant to support him for every block of the school day but who now has an education assistant for just one block per day because budgets had to be balanced after massive cuts to school district funding. Here’s another: a class of 30 students, half of whom need learning support of one kind of another. How will one teacher create and monitor personalized learning assignments for all students in this class? And another: students who have their one meal each day at the school’s breakfast club, who do not have computers, let alone internet access at home, and who have parents who work two jobs just to keep the family fed and sheltered. What do the changes offer these students? This new curriculum is being launched in a province that has the highest rate of childhood poverty in Canada. A province that has no plans to reduce childhood poverty. A province where a teacher’s plea for shoes for her students led to the establishment of a charity to support the needs of students in public schools. A province in one of the richest countries in the world. How can we talk about 21st century learning when so many of our schools could be the setting for a novel by Charles Dickens? I wasn’t quite sure whether to laugh or to cry when I saw an example of how the new curriculum could be implemented for Grade 6 – 9 Science: “Students build a Shelter”. Will children need these skills for when their classrooms come crashing down around them during an earthquake since seismic upgrades for public schools have been delayed for ten years? Being a teacher public school in British Columbia can be so Kafkaesque. There are so many contradictory messages that emanate from the government, it’s hard to make sense of it all. I am often confused by communications from the Ministry of Education. It seems that there are two different personalities that take turns being in charge at the Ministry, just like in the story of Dr Jeykll and Mr Hyde. When the Ministry is being lead by the Mr Hyde personality, as it seemed to be during the 2014 labour dispute with teachers, it issues edicts that cut a teacher’s daily pay by 10%, it locks teachers out of classrooms during lunch so that they are forced to have their lunch breaks on sidewalks, and it refuses to raise teachers’ wages to compensate for the rise in the cost of living. The Mr Hyde version of the Ministry guts public education funding while it increases funding to private schools. It is quite remorseless as it forces the education system into the “affordability zone” while completely disregarding Supreme Court rulings and the Canadian constitution. On the other hand, the Dr Jekyll version of the Ministry mentions the need for teachers to be supported in the work that they do. It seems to value teachers and the role they play in students’ lives. The Dr Jekyll personality not only talks about placing students’ needs at the centre of the learning process, but also acknowledges that doing so would require many changes that are not cost free. So, which version of the Ministry should I expect to show up when the new school year begins? I so want to believe that the Ministry truly acknowledges the “complexity of the teacher’s role” in the classroom. But I just can’t believe the hype until and unless the question of class size and composition is settled. It would be wonderful if a teacher’s right to bargain her working conditions – the learning conditions of students – didn’t have to be confirmed by the Supreme Court of Canada. The fact that it has to be puts a huge damper on all the trumpets heralding the launch of the new curriculum. 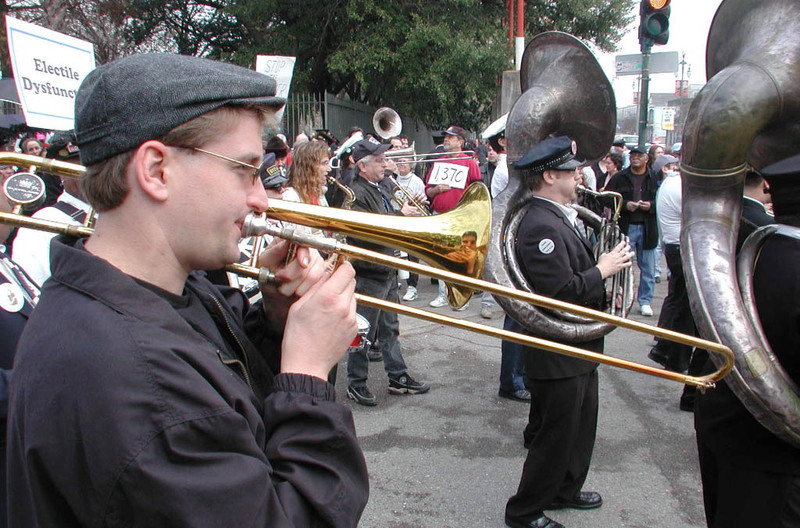 I wish all the celebrations of the new curriculum didn’t remind me so much of being at a New Orleans jazz funeral, where joyful music masks a sad reality. That this image comes to mind is quite ominously ironic since it was in New Orleans that public education was killed and replaced by charter schools with devastating results. Can we expect the same to happen to BC’s education system which seems to be undergoing a kind of death by a thousand (funding) cuts inflicted by the BC Liberals since 2001? I really hate being a party pooper but I can’t unsee what I’ve seen during the past 14 years of BC Liberal governance.